The following post is written by Educator Innovation Lead Jess Boyce. 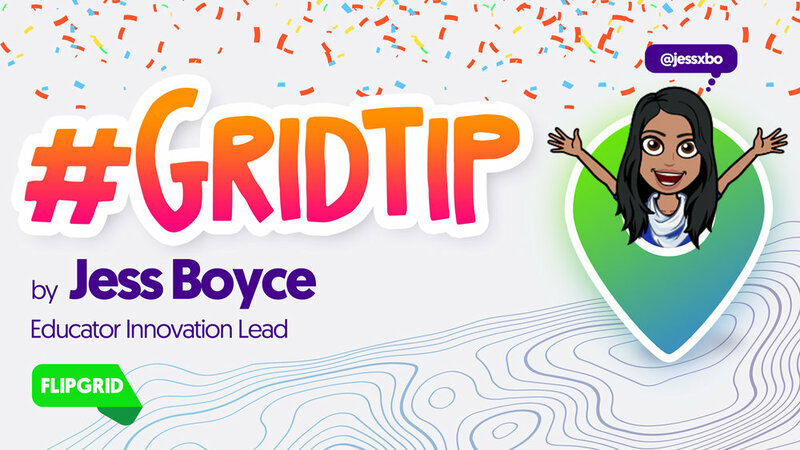 In the #GridTip Series, Flipgrid Educator Innovation Leads Ann, Jess, and Jornea will share tips and tricks to help you explore ideas and possibilities with Flipgrid. Looking for more inspiration? Sign up for one of the Engage & Amplify: Flipgrid 101 Webinars! Have students articulate things that they wonder about. This can be a topic that you are about to dive into (for example, check out Amanda Alessandro’s fiddler crabs Topic for Science class) or simply showing a picture and having students sharing what they see, think, or wonder. Wonderings is a great way to get students started on the writing process. Launch this Topic from Liz Capizzano! Have students answer a question as a lead into the next passage that will be read in class. This can spark discussions on themes, plot, etc. Launch this Topic from Rebecca Rients! Launch this Topic from L Holmgren! What do you think the next unit is about? Show a picture or video and have students guess what the next topic of study will be. Fun twist from Erin Wilson: if students cannot guess what the topic is about, record a new video giving another clue. Launch this Topic from Erin Wilson! Leverage Flipgrid for a twist on the traditional KWL chart. Present students with a topic of study and have them record responses to “What do you know about this topic?” and “What do you want to know about this topic?" After the unit, they can reply to themselves with a reflection on what they learned! What do you think is happening here? Show an image taken from a passage or text. Have students make predictions about the topic, theme, setting, characters, etc. Launch this Topic from Cynthia Neal! Have students find the definition and record a video about it. This could take on many forms – create a video that shows the words, draw pictures to represent what the words mean, use the words in a sentence, etc. Launch this Topic from Malinda Hurt! 🚫 Which One Doesn’t Belong? Show pictures and ask students which one doesn’t belong. Have them justify their reasoning, by explaining why. Launch this Topic from Pamela Warner! Have students come up with hypotheses based on how they think an experiment will turn out. They could reply to themselves at a later time to explain what actually happened with the experiment. Launch this Topic from Scott Titmas! Note that all of these ideas would work great for a flipped assignment: students’ first Response video can be recorded at home and then you can follow up with the companion lesson the next day in class. Whatever approach you choose, have fun getting your students pumped about learning! I look forward to seeing what you come up with!